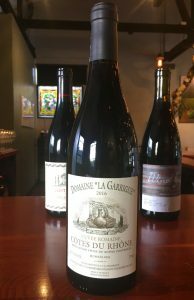 2016 Domaine la Garrigue, Côtes du Rhône “Cuvée Romaine” Southern Rhone, France. The Domaine La Garrigue, founded back in 1850, is run by the same same that started it, now overseen by the brothers Bernard, Maxime and Pierre, who are the fifth generation at this historic Rhone estate in Vacqueyras. This family run winery now has the talented Virginie Combe, a member of the 6th generation, is in charge of the winemaking with guidance from the famous Philippe Cambie, who is one of region’s most sought after consultant. Domaine La Garrigue, named for the aromatic shrub that is ever present in the area around Gigondas and Vacqueyras, is largest domaine in the appellation covering 83 hectares, and they farm mostly Grenache, but also have Mourvedre, Cinsault, Syrah, Grenache Blanc and Clairette vines on the three primary terroirs of Vacqueyras zone. The average age of their vines is about 50 years old, but also have some vines well over a century old on a mix of soils that have marl, of clay and limestone in stony parcels on rugged slopes at the foot of the Dentelles de Montmirail. Deeply colored and flavored the 2016 Domaine la Garrigue is a dark purple/garnet in the glass, it gives off a heady perfume and has a dense palate of fresh boysenberry, plum and sweet cherries adding layers of spice, earth and creme de cassis along with black licorice, this is a very serious wine that not only delivers rich fruit detail, but has plenty of savory substance to back it up. Even with this thick glycerin mouth feel and it’s medium/full body, there is a freshness and vibrancy that keeps everything thrilling from start to finish, it’s impossible not to love this stuff. The Cuvee Romaine is exclusively made from the US importer Eric Solomon (European Cellars) and is crafted from Grenache, Syrah and Mourvedre, and is in fact a declassified Vacqueyras, made whole cluster and raised in 100% concrete vats. From sustainable plots, this blend was from mainly areas that had more clay over limestone with a gravel top soil, which brings out the expressive fruit and it was aged for just about 8 months, all from vines that are over 40 years old. It 2016 it had mainly Grenache and a touch higher percentage of Mourvedre and a small amount of Syrah and it shows incredible complexity and depth for a wine of this price, rivaling wine easily three or four times the price!